On that note, Pot Roast is another one of those items that I think everyone should know how to cook. It's simple like roasted chicken, economical, easily customizable and in the age of crock-pot recipes coming back into fashion, it fits the bill perfectly. There are quite a few prime cuts of meat used for pot roast. These cuts have less fat and are best cooked by long, slow cooking with liquid ( called braising)--This tenderizes the meat fibers. 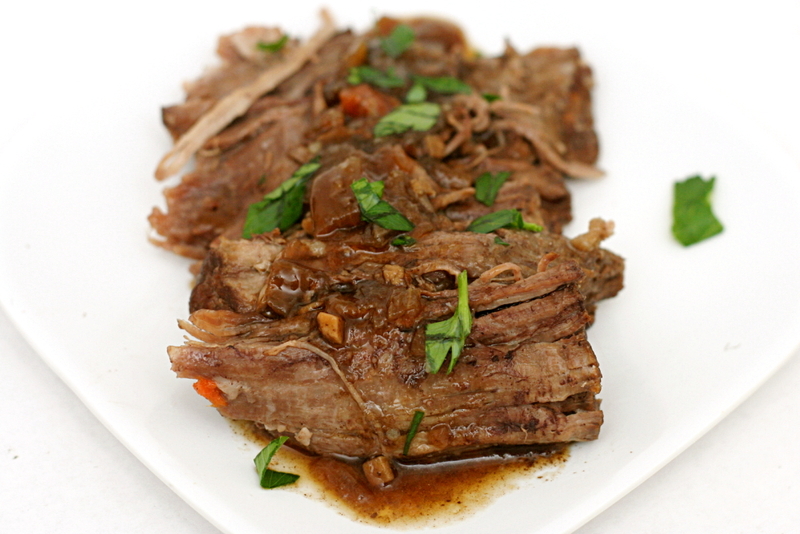 Common cuts used for pot roast include: chuck, brisket, top round, bottom round and rump. Ask your butcher for his or her suggestion for the best cut. The following recipe is NOT made in a crock-pot, but you could make it in one if you wish. If using the oven, preheat to 350°F. Pat the roast dry with paper towels. Sprinkle and rub salt, pepper, and Italian seasoning all over the meat. Use a thick-bottomed pot with a lid (oven-proof, optional) and heat 2 Tbsp of oil on medium high heat. Brown roast in pot, all over, 4-5 minutes on each side. Don't move the roast while a side is browning, or it won't brown well. Sizzle, sizzle... Look at that hunk of beef! When roast is browned, remove from pan and set aside to rest. Add the onions to the pan and cook for about 5 to 10 minutes, until they begin to brown. Add the garlic, carrots and all of the other vegetables on top of the onions. Set the roast on top of the vegetables. Add 1 cup of wine and stock or water. Add the bay leaf. Cover. Bring to simmer* and then adjust the heat to low, while still maintaining a simmer when covered. Cook for 3 1/2 to 4 hours, or longer, until meat is tender. *If you wish to make this dish in the oven, preheat it at 350°F before browning the roast. Place the pot in the over at the start temp for 20 minutes, then drop the temperature to 225°F. For crock-pot-lovers, 6-8 hours on low or 2-3 hours on high. Cannot wait to see you on television this weekend! Remember to post the link/information either here or your Facebook so that I'll know when to tune in! I hope you enjoyed, Janet!